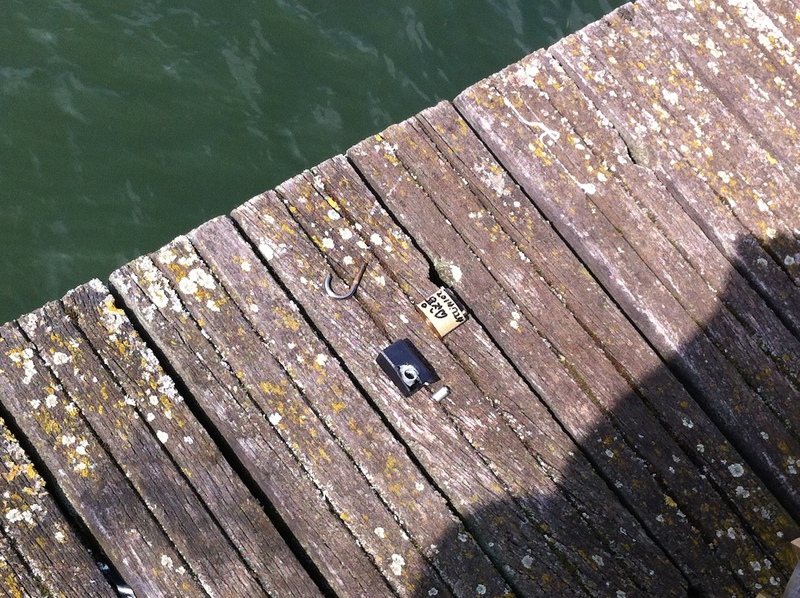 Late yesterday afternoon, we received word that something amazing had happened on the Pont des Arts. So this morning, we raced there to see for ourselves. And here is the surprise: GLASS PANELS! 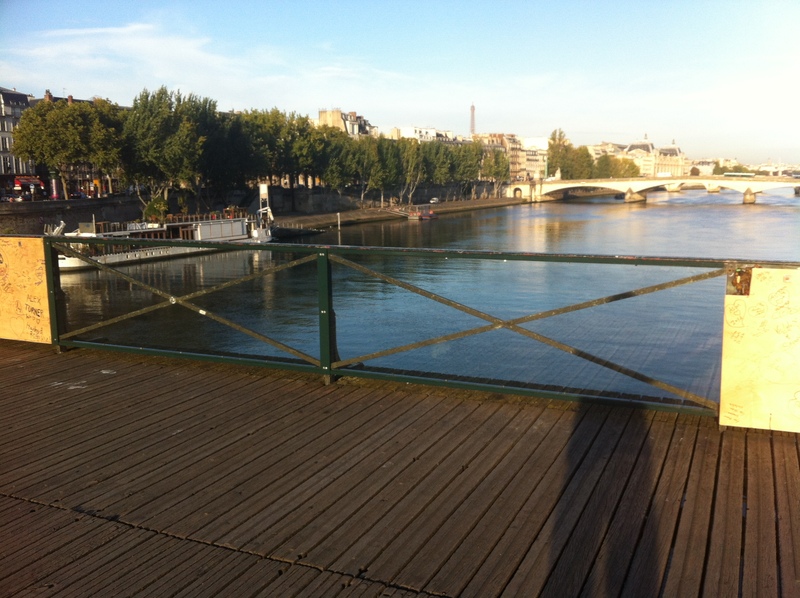 The REAL Pont des Arts, revealed by specially designed glass panels! 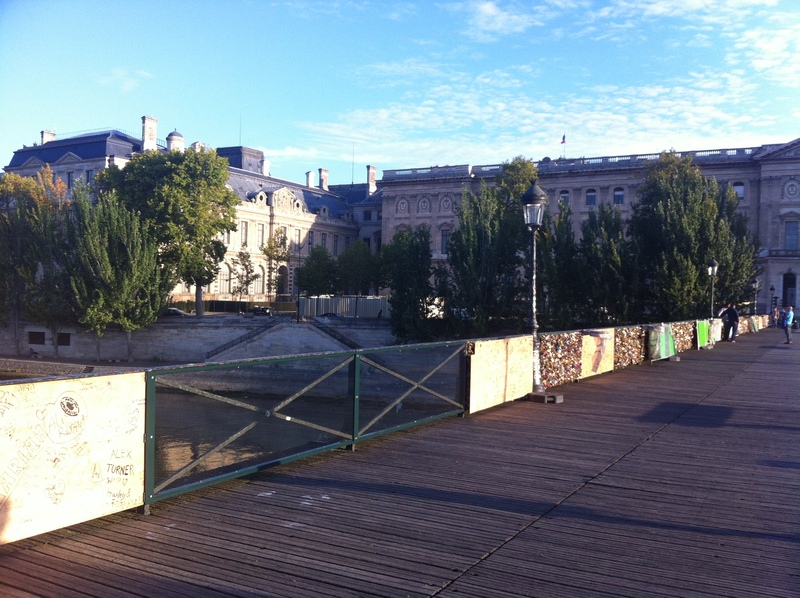 No Love Locks has today received official confirmation from the Mairie de Paris, the office of First Deputy Mayor Bruno Julliard, that these two panels will shortly be joined by a third. 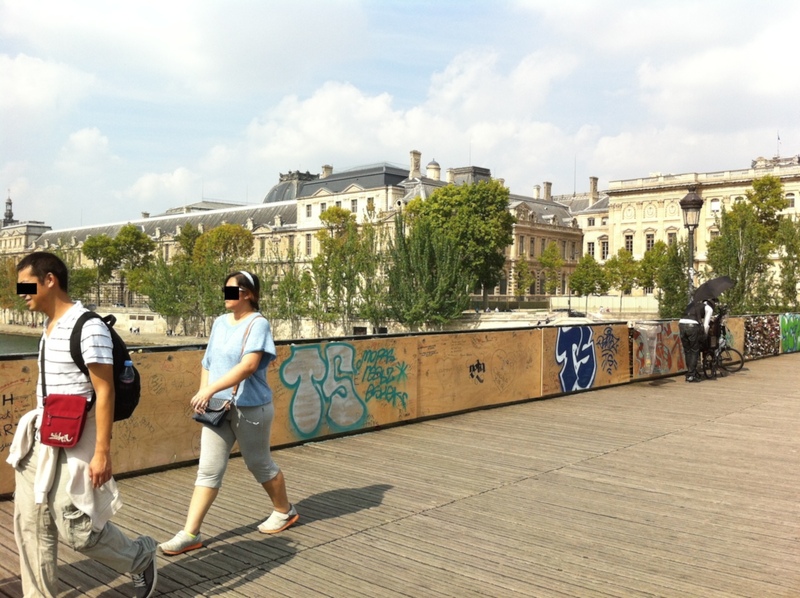 They are being placed on the Pont des Arts as a test of an alternate to the type of fencing that permitted more than 60 metric tons of padlocks to be attached. 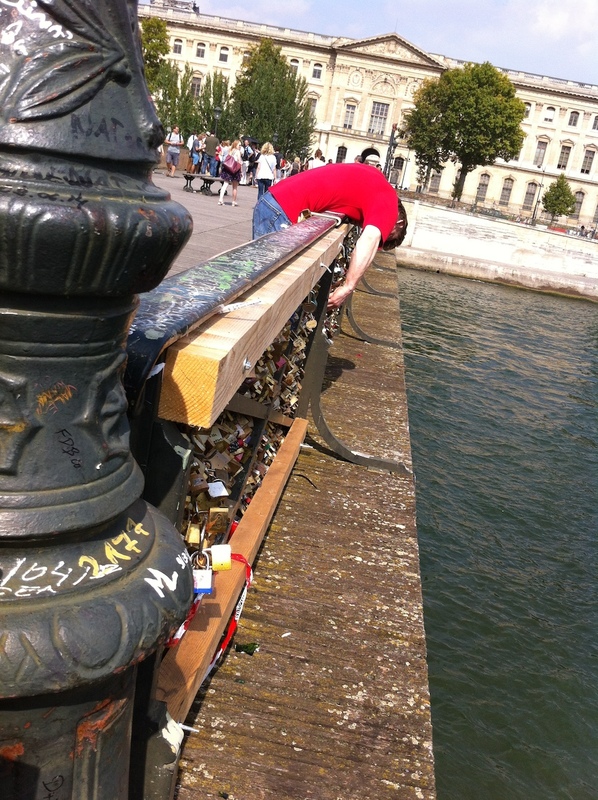 As part of their efforts to remove padlocks from all bridges and monuments in the city, the Mairie must also address the issue of preventing new locks from being attached. These glass panels are the first serious such effort at prevention. 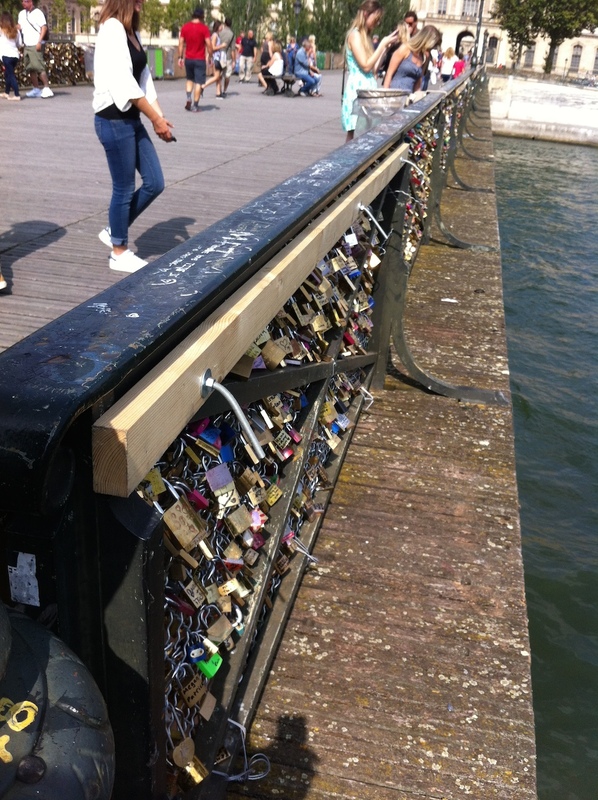 It is clear to see from the photos that there is no place for a lock to be attached – hooray! According to the Mairie, this is a special type of glass, and it is not plastic or Plexiglass. It is designed to be shatter-resistant, anti-glare, and it is treated with something that will not allow graffiti tagging. The City wants to test how well this works, and if it is a success, we can expect to see other panels replaced with the same glass over a period of time. The costs to the City to replace all 110+ panels on this bridge alone will no doubt be considerable, but when compared to the damage caused to the bridge from the locks over the past 6 years, and the constant upkeep costs as well as the security risks posed by the heavy locks, this is an investment we hope the City will deem worthy. The difference between the ugliness of the locks and the graffiti-covered boards, and the lovely, clear glass panels – it’s astounding! 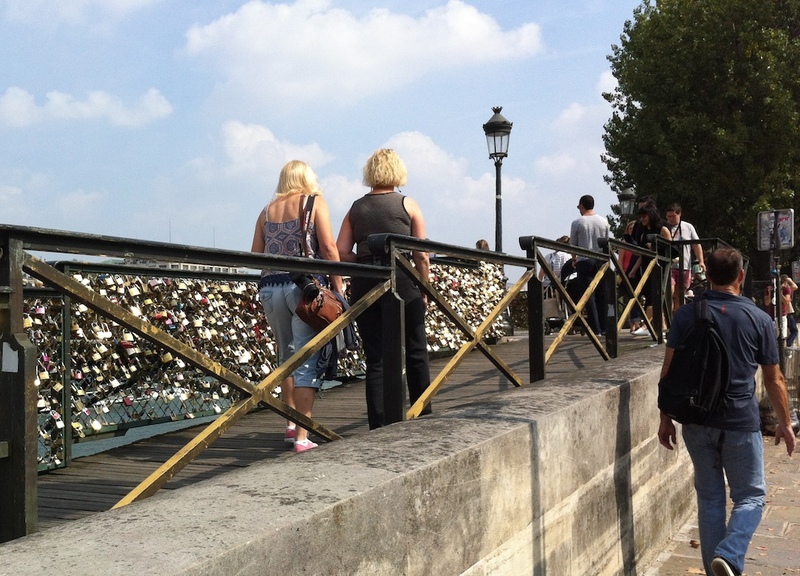 While this is exciting to see, the fight to rescue Paris from locks-obsessed tourists is far from over. 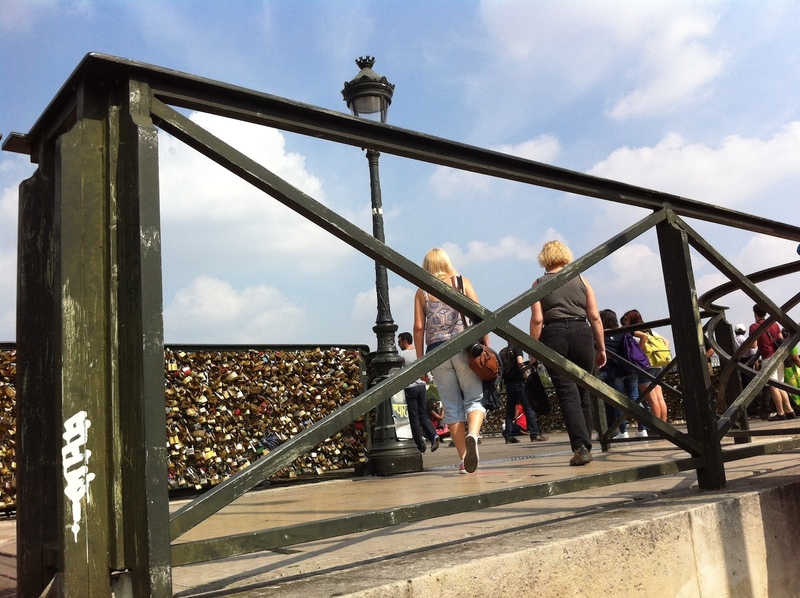 There are so many bridges and monuments in Paris where this plague of padlocks have already spread, and it will not be easy to prevent them in all cases. 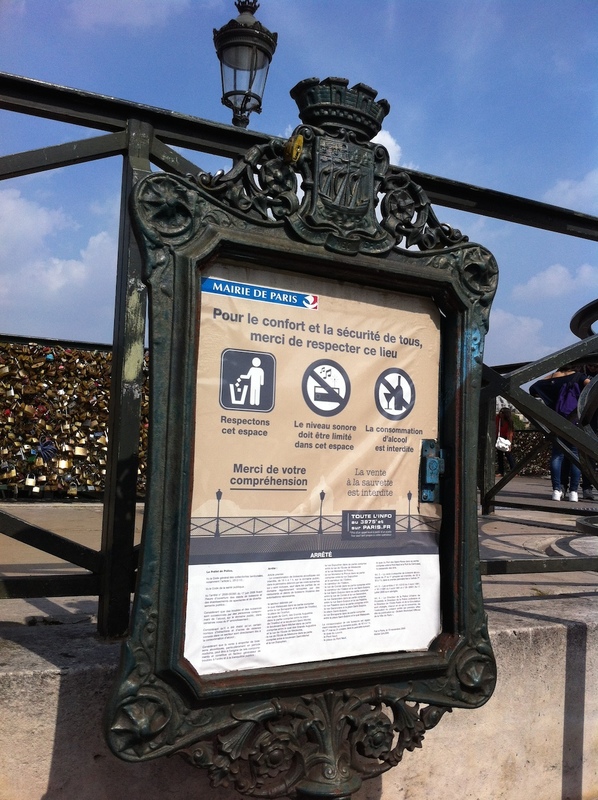 We still intend to push for a ban on locks, and for multi-lingual signs to be posted at all bridges and monuments informing the public that padlocks on city property, on historic structures, will be treated as vandalism and subject to fines accordingly. 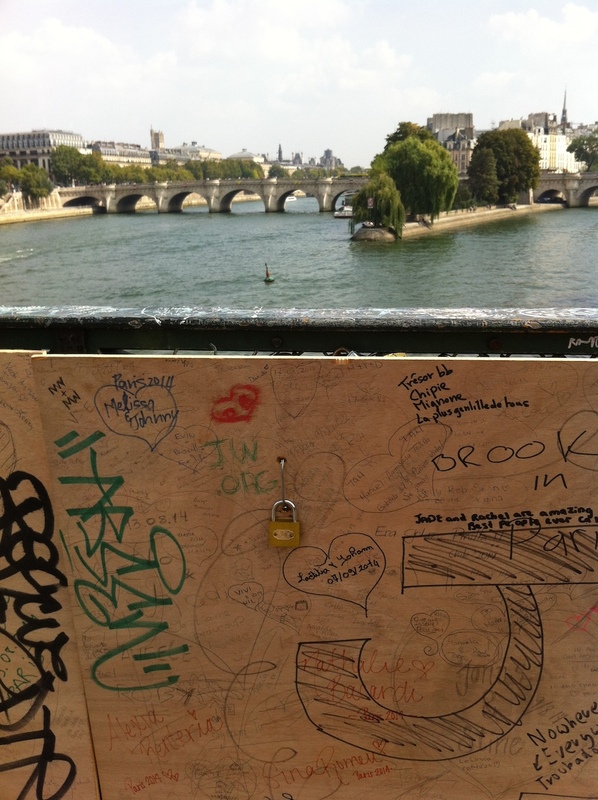 It is clear that the City wants the locks to be gone from Paris, just as we do. 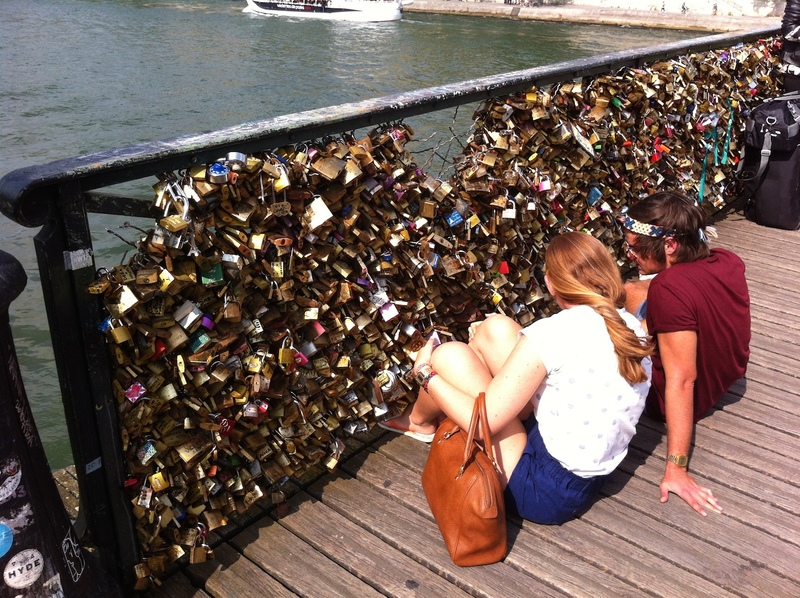 We still firmly believe a ban will help make that a long-term reality, and we still urge our supporters to continue to spread the word that love locks are NOT an appropriate symbol of love and that they are selfish acts of vandalism. 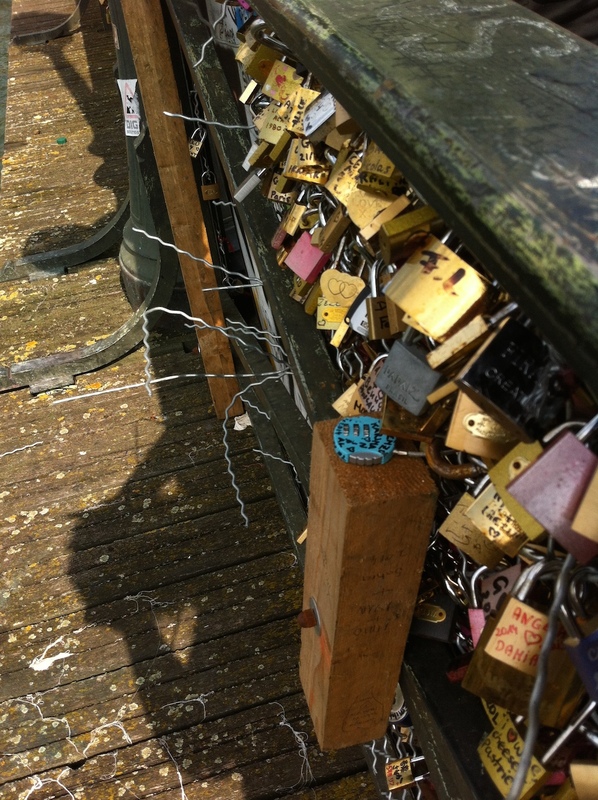 The love locks epidemic is the result of a certain type of tourist, someone with an entitlement mentality. But let’s be clear – no one has the right to put a lock on Paris! This new development is an important, visible step in the right direction. It gives us hope that the end is in sight, and that we are winning the war on irresponsible tourism. 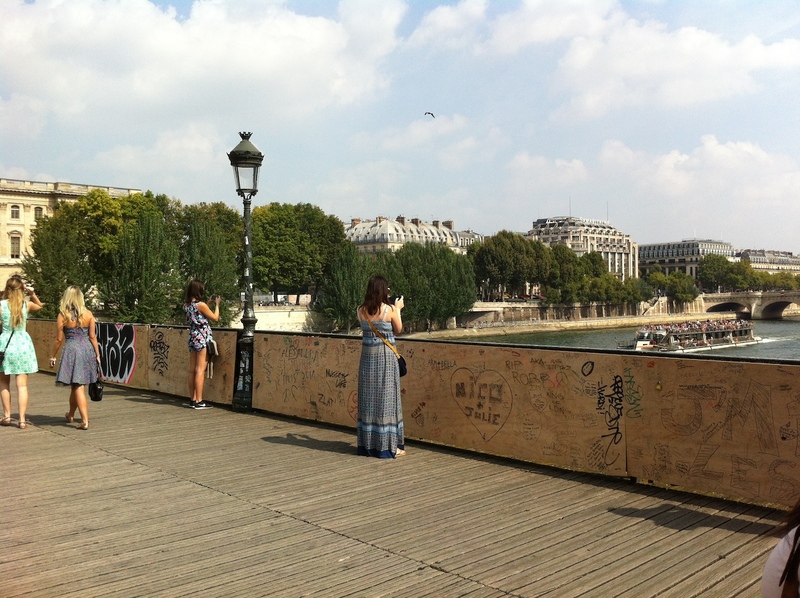 We can now begin to imagine the riverfront of Paris soon reverting to its original beauty, the public spaces returned to Parisians who have been deprived of them and to the millions of responsible visitors who genuinely love this special city. Looking through the clear, locks-free glass panels at the river and riverbanks below, one can only think: This is the Pont des Arts as it is SUPPOSED to be. These are some of the best views of Paris at their loveliest and most unspoiled. 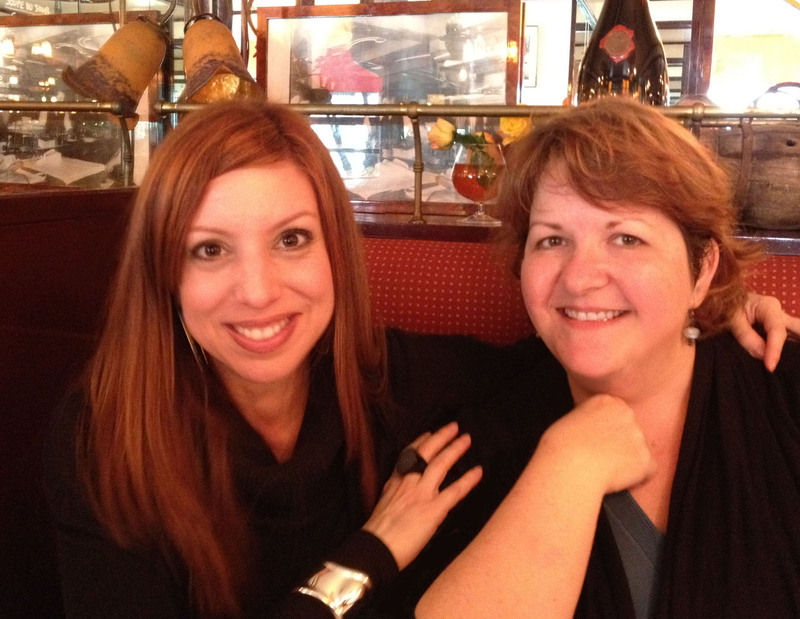 This is OUR Paris, friends, now being restored – one glass panel at a time. 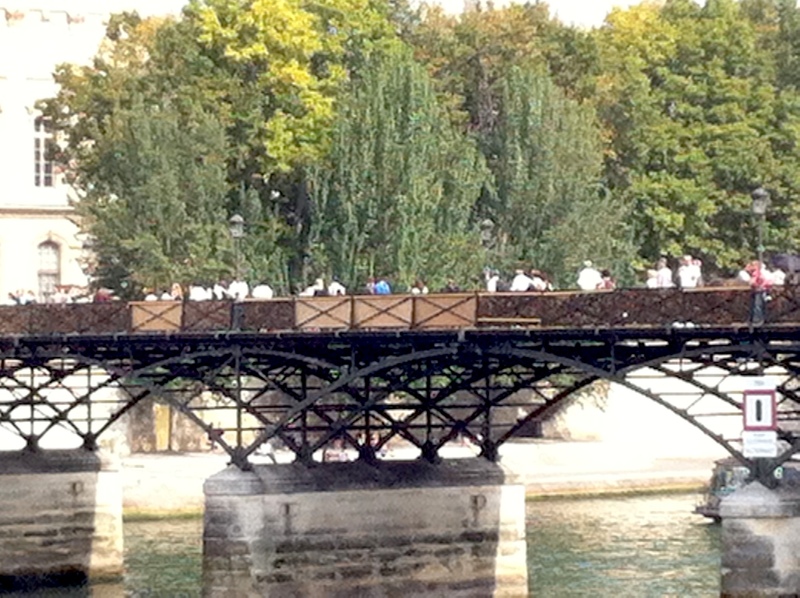 Today, I took a walk over the Pont des Arts. I hadn’t been back there since early July after yet another panel had collapsed, and the condition of the bridge was so appallingly bad on that day that I actually felt unsafe on the bridge for the first time. After having made over 40 visits to that bridge since the beginning of our campaign in January, that’s a significant statement. 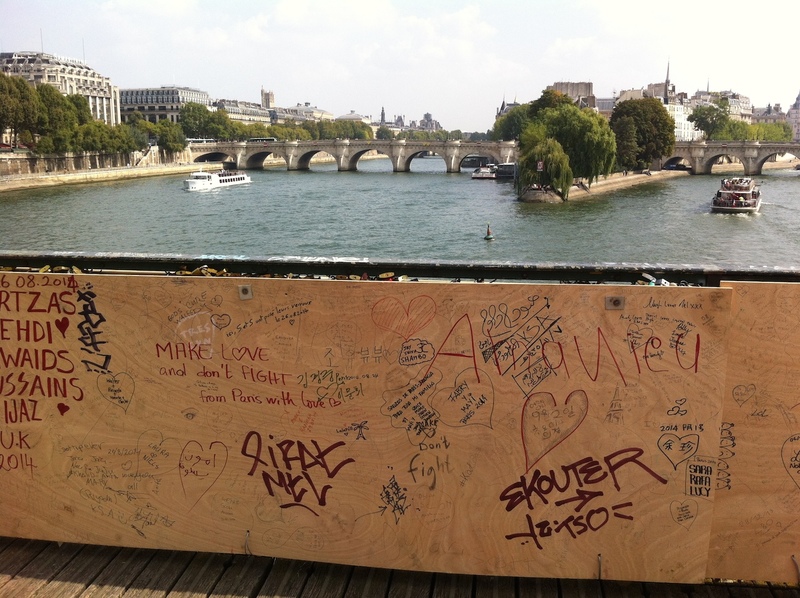 I was, of course, aware that in recent weeks the City has begun simply attaching plywood boards over the worst of the collapsing panels in an effort to protect the public and to prevent new locks from being attached. 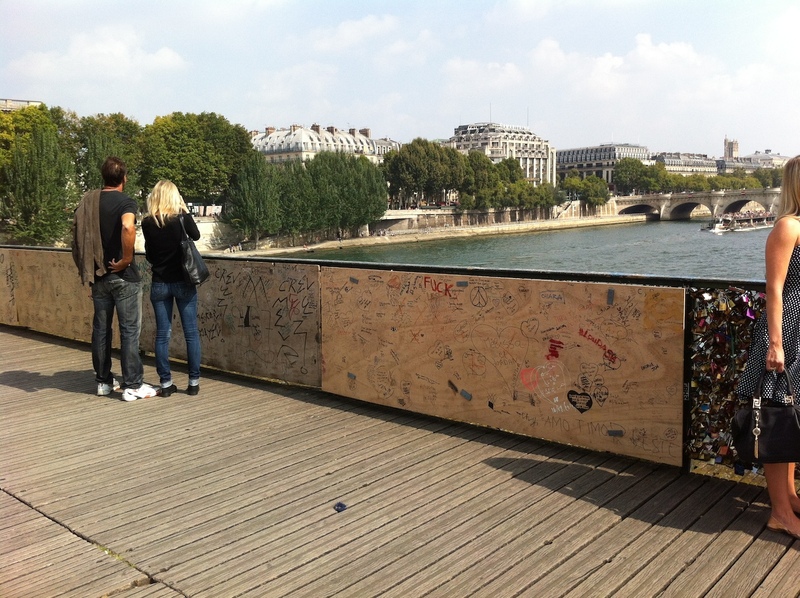 But I was not at all prepared for seeing more than half the bridge boarded up! 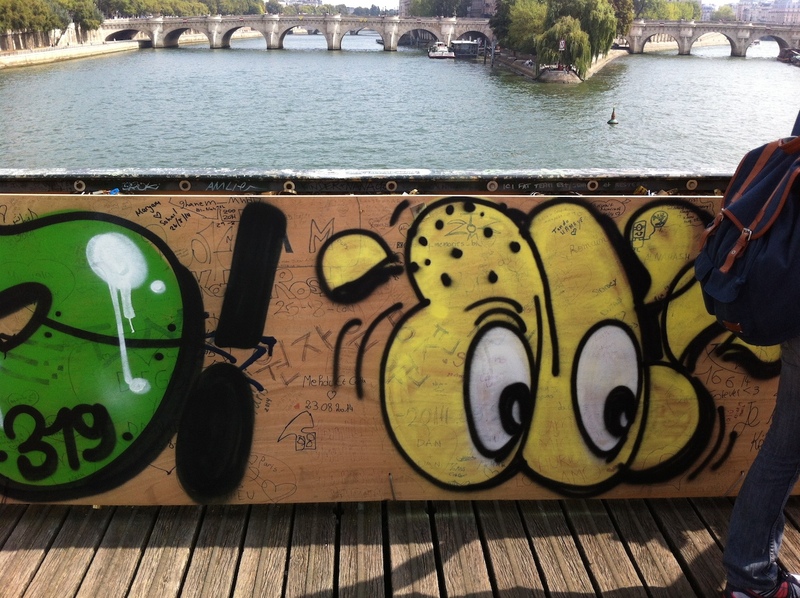 There are, as of today, 57 out of 110 plywood covered panels on the straight expanse of the iconic bridge — plywood that is also now covered from stem to stern in the ugliest graffiti. This once calm and lovely UNESCO World Heritage site has turned into just another boarded-up, graffiti-covered urban trash dump. And yet as ugly as it is to see all those boarded-over panels, the plywood actually makes much more sense than continuing to replace the grillwork with new wire, because the panels only fill up with locks again within mere days. 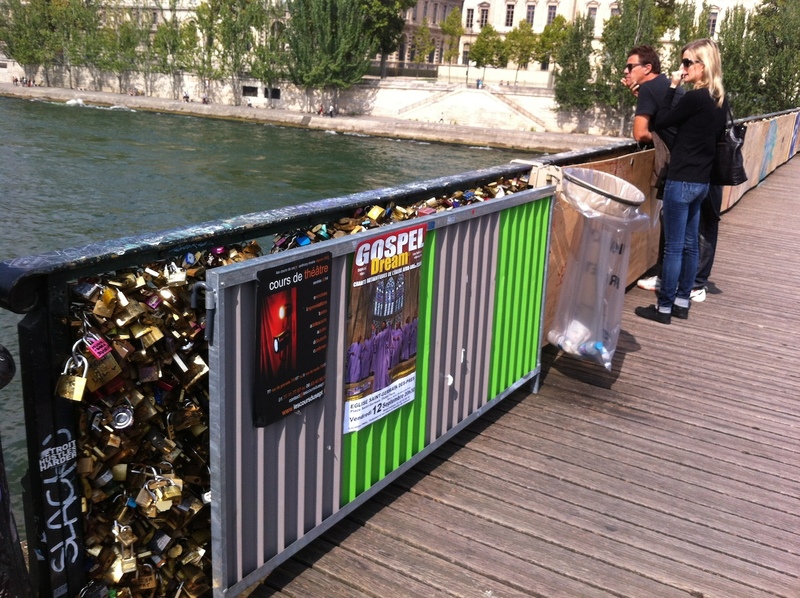 Better to let visitors see the destruction and havoc their “innocent little love locks that aren’t hurting anything” (a lame protest we have heard often in the past 6 months) are actually causing. 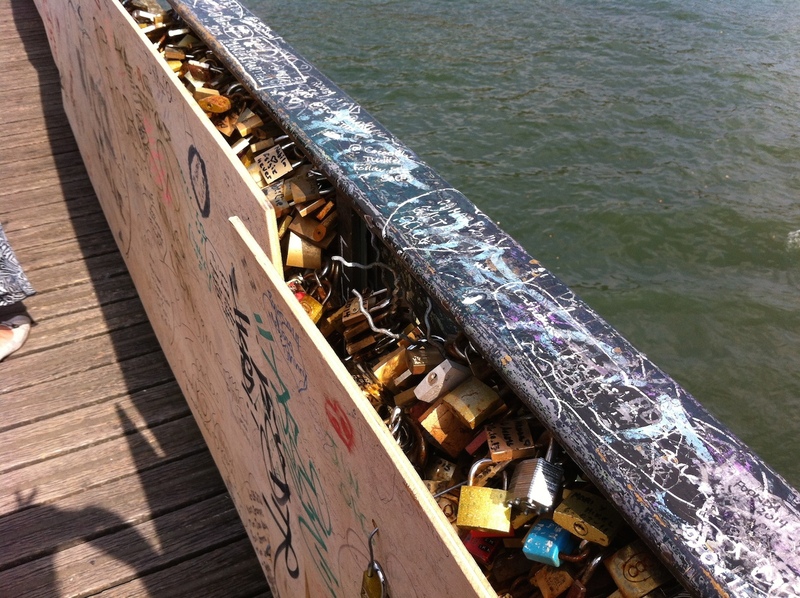 Wake up, people — if you’ve put a lock on this bridge, YOU caused this mess. 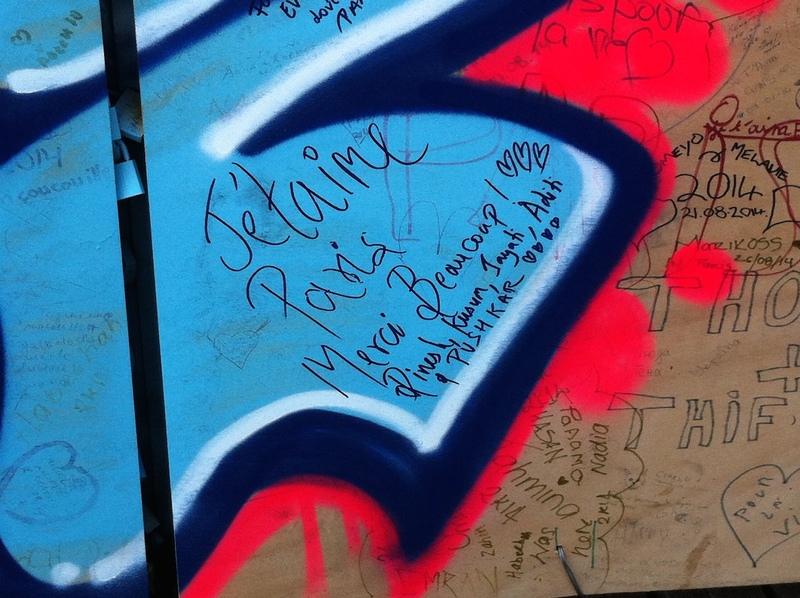 Hope your “declaration of love” was worth it to you, because it certainly isn’t worth it to Parisians. Enjoy your vacation while we pay to clean up your garbage. In any event, better to just board up the bridge than continue to pour taxpayer money down the toilette over and over again. Until the City can finally figure out how best to remove all the locks and prevent new ones from being attached — we do know they are working on this — and until the Mayor’s office is finally ready to face the reality that some people won’t stop until they know this is BANNED and that fines will be levied, there is no point in trying to replace the grills at all. Even with the boarded panels, there were still some tourists on the bridge today locking up their stupid little locks, and the illegal locks sellers are still there in force although I suspect business has dropped off now that more than 50% of the bridge is unable to accept new locks. In the coming days, we will have more to share with you about the state of our campaign, what we know about what the city is planning to do, and what our next steps are. 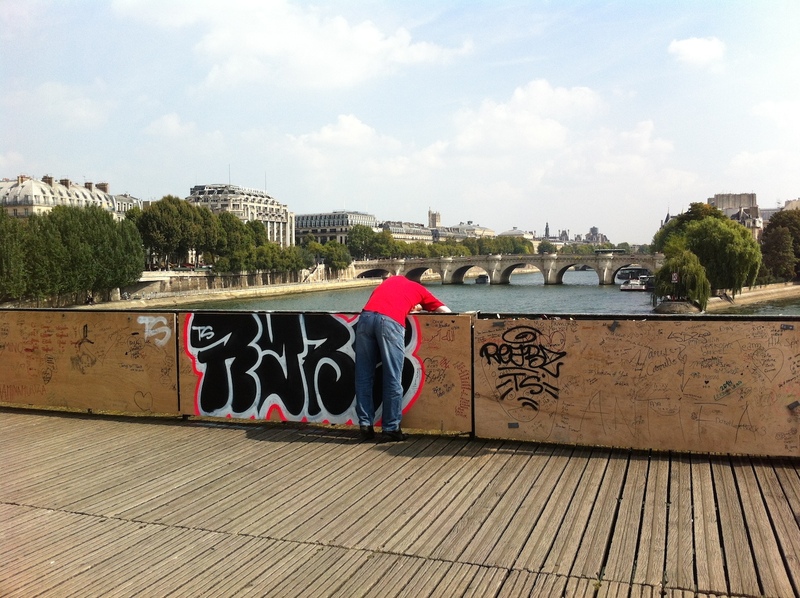 Until then, let me share with you the images I took today on the Pont des Arts. 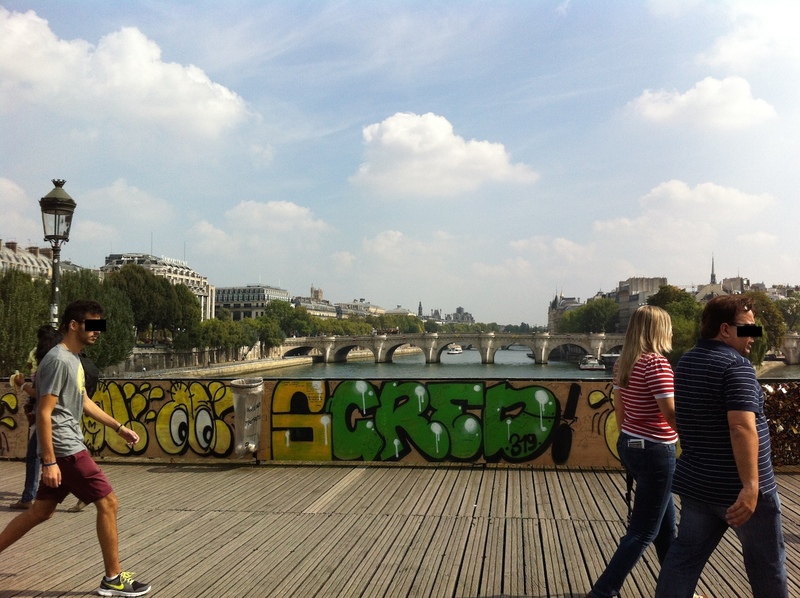 They will break your heart as they break mine, because this was once my favorite view in Paris. Look at it now. 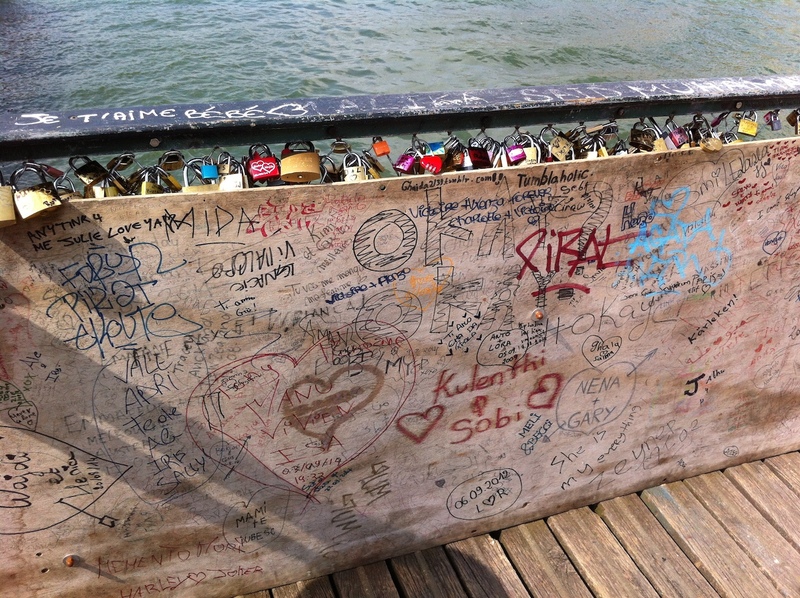 All images dated September 7, 2014 and Copyright ©No Love Locks. May not be used, distributed or copied without written permission.